In Asia, spot styrene prices have started to respond to the lower crude oil prices on NYMEX, which hovered around $40/bbl during this past week. Meanwhile, in the PS market, import offers given to China hit the lowest levels seen for the last five months, according to ChemOrbis. Earlier in the month, spot styrene’s response to lower crude oil prices was rather limited on the back of the upcoming planned maintenance shutdowns in Taiwan between August and November, during which a little over 1 million tons/year of styrene capacity is expected to be halted. However, generally weak demand in China due to the sharp drop in Chinese manufacturing, played a role in slowing styrene purchases. Plus, increasing inventory levels, especially in East China, were also causing lower styrene prices inside China. Styrene prices on FOB South Korea basis declined $185/ton on the week while they are around $250/ton lower when compared to the end July levels. Meanwhile, the weekly decline on benzene costs are reported to be around $85/ton while the cost of benzene is down by $195/ton since end-July. On NYMEX, crude oil prices fell almost $7/bbl during August. Bearish upstream developments and the devaluation of the Chinese Yuan amidst a weak economy have taken their toll on the PS market. 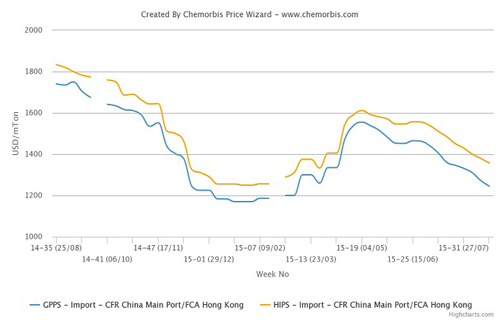 Players in China reported lower import PS prices during this past week while import PS prices hit a five-month low, according to ChemOrbis Price Index.